Home Cover Feature UNDER THE LOLLIPOP TREES…a new panda batik jacket on Ebay! 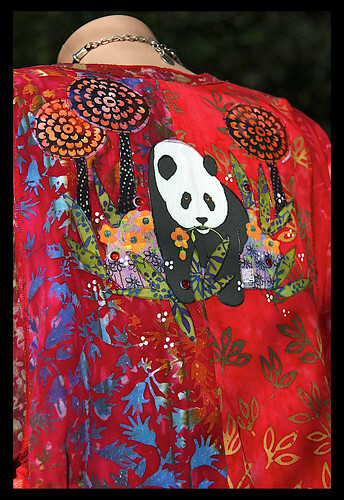 UNDER THE LOLLIPOP TREES…a new panda batik jacket on Ebay! CLICK PHOTOS TO ACCESS THE AUCTIONS! PLAYING WITH DRAGONS card got a TBA today!! I’m very excited to be getting emails from so many of you reporting your bead packages have arrived!! I got behind on replying to emails in the past 24 hours and will be answering you all asap. I had a minor panic attack when my 2 year old flatscreen computer monitor (my HUGE blind lady version) wouldnt wake up this morning. I had instant thoughts float through my head that it will be a choice…a new monitor…or my trip in February…Nooooo!! Thank goodness the crazy thing must have heard my pleas, and suddenly turned on midday. How weird is that? Now I will not let the computer “sleep” at night until after my trip . I’m worried it won’t wake up again! LOL!